Once derided as the derriere of Melbourne's CBD, the west end is undergoing a marked revival with a slew of residential projects about to begin. This revival largely can also be attributed to the ongoing development of Docklands and the redevelopment of what is now Southern Cross Station, with the resultant epicentre of Melbourne's CBD slowly shifting to the area around King and Spencer Streets. One of the latest projects to hit the market following a colourful history at planning. Once the site of the beautifully crafted Federal Coffee Palace, 555 Collins Street currently stands as the empty concrete edifice dubbed Enterprise House. Initially seeking planning exemption for a commercial building of 400m, owner Harry Stamoulis sold the site to Fragrance group who tried for a 90-storey, 300m tower designed by Bates Smart. That was reassessed following backlash during the planning process and was eventually replaced with a 47-storey pleated tower rising from a tapering base. 624 apartments constitute the tower. 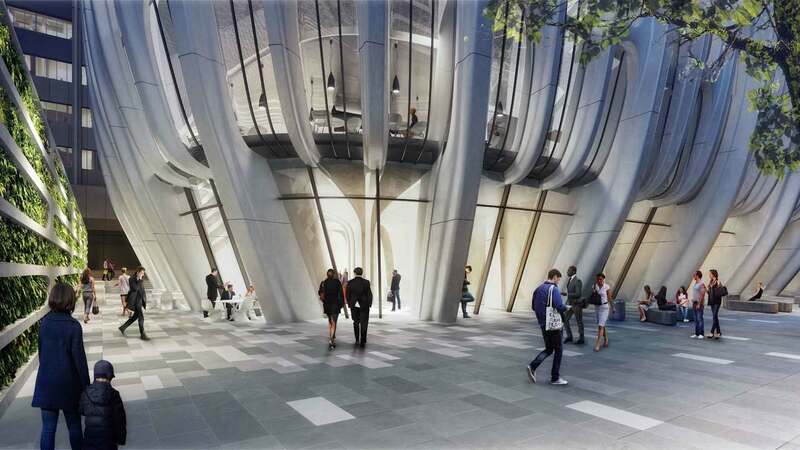 555 Collins Street will provide a dynamic and elegant residential tower regenerating a prominent, but neglected corner site within Melbourne’s CBD. The tower form is distinguished by a unique tapered podium which allows for the creation of an increased public realm and generous retail precinct. The tapered base also means daylight can filter into the internal spaces, while at night, light will illuminate the surrounding precinct. A continuous pedestrian loop will link the development with the adjacent building, expanding public amenity and creating a contemporary addition to Melbourne’s collection of laneways. 555 Collins Street is currently at sales and registrations. Stage 1 of West Side Place comprising two 200m + towers including a Ritz-Carlton hotel, and is set to commence construction in coming months following a successful sales campaign, with few apartments remaining. Developer Far East Consortium is now pushing ahead with the next stage - The Gold Release Residences - set for launch on June 3rd via Colliers. Rising 72-storeys for an approximate height of 245m, the Gold Release will sit to the east of the Ritz Carlton with a laneway separating the two towers and frontage along Lonsdale Street. 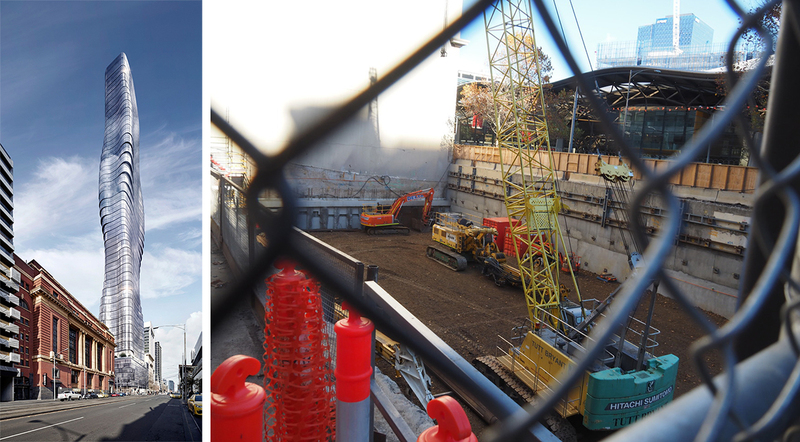 A fourth and final tower of 69-storeys and approximately 235m high will complete Far East's regeneration of two city blocks, which it began with its Upper West Side development on the site of the former Lonsdale Street power station. The Gold Release is the newest stage within the Ritz-Carlton precinct offering one and two bedroom residences up to level 70 and featuring expansive views across Port Phillip Bay, Melbourne’s city skyline and beyond. The Gold Release represents sophistication, elegance, value, quality and status. Everything that is synonymous with West Side Place and the Ritz-Carlton. Designed to maximise natural light, residences are available right up to the clouds at level 70, across the following three offerings of Sky Residences, Central Residences, and Garden Residences. Premier Tower replaces the old Savoy Hotel on one of Melbourne's more prominent corners. The site is now at piling following initial demolition and excavations, with the result a 249m tower and 600 plus apartments. 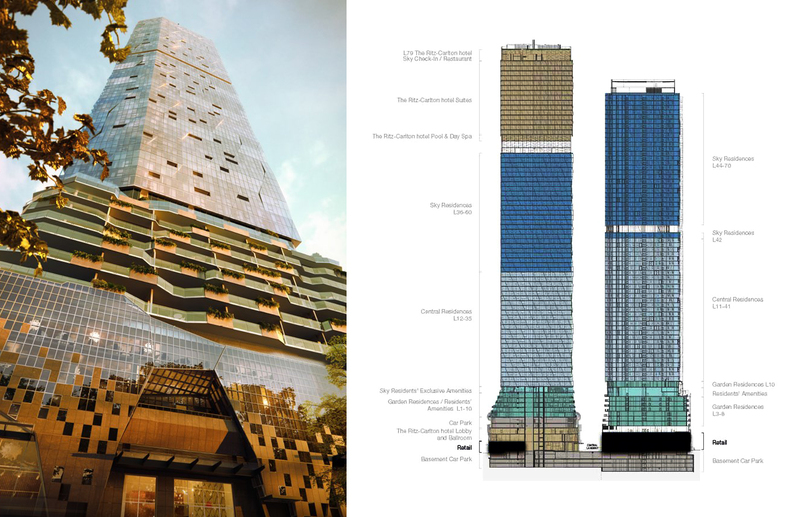 Fragrance Group are behind the Elenberg Fraser-designed tower, with Multiplex the head contractor. We know you’ll agree that when you hear the phrase ‘less is more’ the first person that springs to mind is Beyoncé. No? Well – our new mixed-use building 134 Spencer Street provides the link between the two. At once a building that is the essence of first principles design – created entirely by parametric modelling – meanwhile its spiralling curves recall the twists and turns of a woman dancing in black cloth. The deceptively complex form is the result of our research into wind, solar and massing criteria – the form is the best possible solution to all of those requirements. On top of that – we’ve taken the heritage surrounds into account, stepping down from the podium to meet them at eye level. This building is just another step in the westerly shift of the CBD. Initially receiving approval for a height of 208m - down from the initial proposal of 83-storeys and 269m - owners Farinia on sold the site with approval for a residential scheme by Plus Architecture to Aurumstone Group. Aurumstone has since engaged Elenberg Fraser to rework the scheme in readiness for a imminent sales campaign. Gone is the pearlescent façade which would produce a pink, bluish, purple effect depending on how light was cast over the tower. Likewise the tower's form has been rationalised with curvaceous lines and a bulge in form toward its peak. 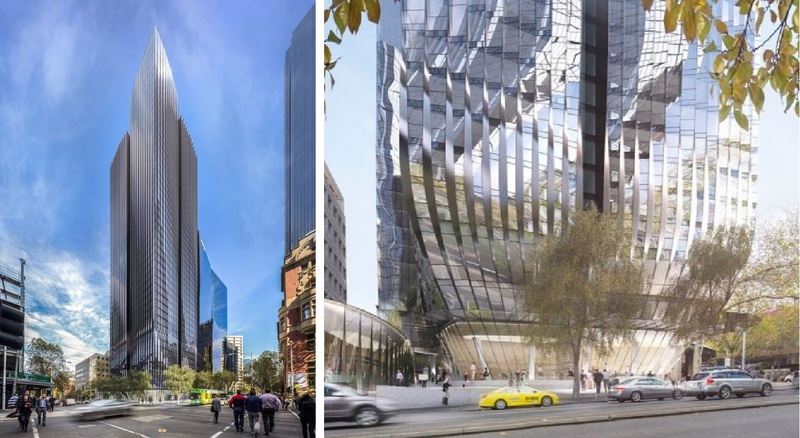 The project will be serviced by a single tower crane, with major elements including façade and floors fabricated off-site and rapidly assembled on arrival at Collins Street. As such Hickory anticipates the overall construction programme on the Bates Smart designed tower will be reduced by up to 30%. The 60 level Collins House project incorporates the grand heritage façade of Melbourne’s historic Maker’s Mark building with a sleek contemporary tower. Located on a small site footprint in central Melbourne, Hickory’s construction method for the project incorporates our own volumetric structural system, allowing building componentry to be erected more efficiently than a conventional formwork approach would have allowed. Once complete, the 204-metre project will boast 271 luxury apartments ranging from two and three bedrooms to double storey loft apartments over a single basement level. Communal facilities for residents include Collins Terrace on Level 3, a private indoor / outdoor space with private dining and gourmet kitchen and the St James Club on Level 27, a private club space with fitness facilities, outdoor deck, dining room and bar. Developer Landream has applied to amend the approved plans to include a six star hotel in the tower with a marketing campaign not too far off for the ZHA and Plus Architecture designed tower. The development distinguished by 3-stacked vases, will deliver a plaza to Collins Street and laneway to the west of the site activated with retail and a gallery space. ^00 Collins was approved with 420 apartments in place, although that final release will likely see this number change. The design has been defined by Melbourne's rich and diverse urban landscape, reinterpreted in a contemporary solution driven by the logical division of its overall volume that will enhance the city's public realm with generous communal spaces. We are honoured to be working with our partners in Melbourne to deliver this project for the city. - Michele Pasca di Magliano, Zaha Hadid Architects. ^^ or rather that's the DEconstruction of Collins House, down to merest facade. I don't understand how "new life" will magically be breathed into the area. The public domain will have little improvement. No realistic open space will be provided and canyons will be carved from out of scale concrete and glass. Basically a poor man's Honkers.....with s**t weather. New residents will generate activity after business hours. Businesses servicing these residents will spontaneously open due to demand. Much like the northern end of the CBD around Elizabeth St, an empty and desolate part of the city at dark will be transformed to something with a pulse. It's happened already around Elizabeth st, which has similarly street, space, and existing retail structure to the western CBD (which sets it apart from Southbank). Apartments Galore was my favourite Bond Gal. Without amenities and actual decent street activation I fail to see how banging up apartments one after the other down this way will help. Are you telling me that the Woolies at Southern Cross is meant to be the default shop for the thousands of residents down that way? There's a Coles under the old DFO as well, but that's already struggling to cope with Upper West Side alone, let alone what's to come. I think there's provision for a tiny amount of retail space in West Side Place, but that's it.